Typical of NBC to make us wait until 7:20 to watch the game of the year. But you'll hear no complaint from me! 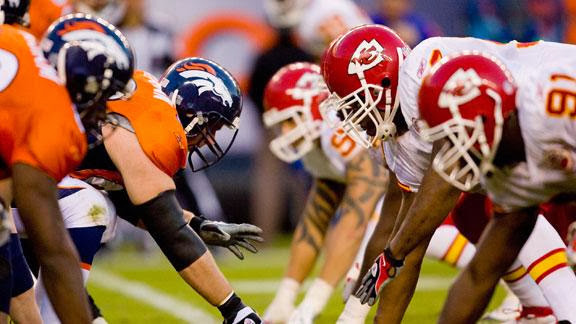 It's the biggest game, set on the biggest stage, at the biggest time.Tonight, it's the game we've all been waiting for as the Kansas City Chiefs (9-0) march into the Mile High City against the Denver Broncos (8-1). Let's break it down starting with the away team. Coming into the season, nobody would imagine that last year's worst team would be in any discussion for participating in the game of the season. All that just shows you how a new left tackle, quarterback and head coach can change your team. For example, at this point last year the Chiefs were 1-8 and the last time they played the Broncos they lost 38-3. However, Andy Reid clearly feels more optimistic this time around. When asked about what mindset he should handle coming into this game, he said, "You get ready to play a good football team. You do that every week. You study and respect them, and then you get yourself ready to play. Later in the same interview, when asked about how to handle Peyton Manning, he responded, "he is one of the 22 guys that contributes to a football team." That kind of answer shows you the confidence that Reid has in his defense, which ranks first in points allowed at 111. For the home team, expectations have been met in extreme fashion. A very hot preseason Super Bowl pick, the Denver Broncos are number-one in the NFL in total offensive yards, points and third down percentage. I've heard some people say they are the best team assembled since the 2007 Patriots. Yes, it is true that the Broncos suffered their one and only loss to the same Colts team that was obliterated by the Rams, but every team (even the 2007 Patriots) makes mistakes. The major problem I see with the Broncos is injuries to their offensive line. With Orlando Franklin and Manny Ramirez having some bruises and setbacks on the season, neither of those names can touch the injured left tackle Ryan Clady's IR status (Left Foot). Theres no question that Peyton Manning's left hand man's injury isn't a major setback. But even with the setbacks and not perfect record, I'll stick with the popular choice among experts. That's it, folks. I hope to see you tuning in to NBC at 7:20 with the rest of America. In the mean time, follow us @TruSchoolSports and myself @ItsMitchellO. Have a great night!